I had read and seen Yorkshire Pudding for years but never had the chance to give it a taste. Over the holidays I had some extra time and was looking for something to add to a roast beef dinner when I came across Michael Ruhlman’s recipe. Giving that a once over and looking at other popover recipes I’d bookmarked over the years led to the simple list of ingredients and rapid cooking. At dinner my daughter said they tasted like pancakes. Combine the dry ingredients in a pitcher, mix, then add the wet ingredients. Mix thoroughly with a hand mixer or immersion blender and set aside for two hours. Preheat oven to 450 degrees, then give the batter another mix. 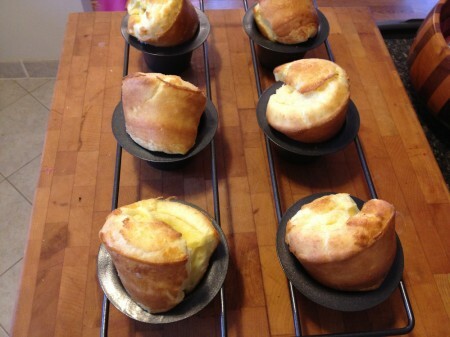 Using a popover pan or large muffin pan add a teaspoon of hot fat to each cup and fill 3/4 with the batter. Bake in the oven for 15 to 25 minutes, until they’ve risen up and turn golden brown. Serve warm. The pitcher and immersion blender make preparation, mixing and pouring very easy.